When I got married, one of the things my mom gave me was the “More-With-Less” Mennonite cookbook, something she and my dad had often cooked from in the early years of their marriage. Although I haven’t used it nearly as much as I should have (as everything we’ve tried has been excellent), one of the staple comfort dishes in our house is the recipe for curried lentils found in this book. In fact, it was the first recipe I tried making from the book because it is one of my parents’ favorites! 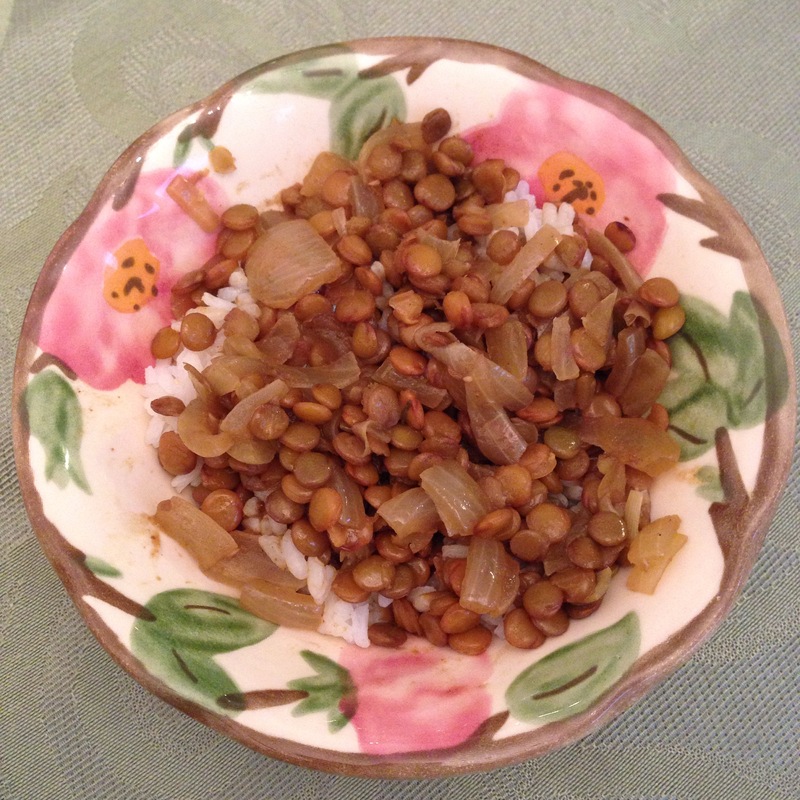 The lentils are easy, delicious, and very filling. They can be eaten on their own or served with rice — and sometimes rice is necessary, depending on how hot the curry powder makes the dish! (For example, the curry powder currently in our pantry happens to be very spicy, much more so than what I had picked up in a small tea and spice shop recommended to me by a local in New Delhi when we were in India!) I’ve even made them vegetarian-friendly by using vegetable instead of beef bouillon. Although the weather here cleared up at the end of the day, when I was running around town doing things it was quite cold, overcast, and threatening to rain… so I decided it was the perfect day for this warming dish. To make it even nicer for me, I ended up chatting on the phone with my mom when I was making it today; while she isn’t actually here with me, for a while, it felt like she was! Bring all ingredients to a boil and simmer 20 minutes. Yum! I love anything and everything with curry! Curry is also a staple dish in our house and one of the handful of recipes I can make without a recipe. I usually make chicken curry, but we also love lentils! I will bookmark this! I’m trying to find the recipe, but it appears that the website/blog doesn’t exist anymore! Here’s the recipe shared on another website, but it’s missing the last part of the instructions…. I remember altering the recipe a bit, but right now I don’t remember what changes I made. If I remember I’ll let you know! Thanks Chrystin! Can’t wait to try it!